Actress Angelina Jolie has secretly been dating Colin Farrell for two months, a report says. Jolie saw with four of her six children at the world premiere of the recent Disney film, Dumbo, starring Colin Farrell. 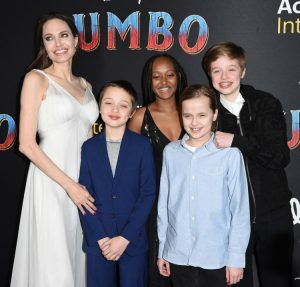 Jolie and her children – Zahara, 14, Shiloh, 12, and 10-year-old twins Vivienne and Knox – were at the recent premiere of Disney’s Dumbo. Jolie stars as Maleficent for Disney and will reprise her role in an upcoming sequel. A report in OK magazine suggests that Jolie’s ex-husband, Brad Pitt, is upset with Farrell (his friend) for dating her. Pitt and Jolie abruptly separate at the end of 2016 and have since been involved in a bitter custody dispute over the kids. They were together for the first time recently, reportedly at a meeting about their children’s custody. But are Angelina and Colin really dating each other? Is Angelina Jolie still in touch with Brad Pitt and Why did they Breakup? Is Angelina Jolie and Colin Farrell are dating? Angelina and Colin are secretly dating each other, reports claim. Although there’s nothing surprising in seeing the Hollywood star and her brood enjoying a night out on the red carpet of a family film. 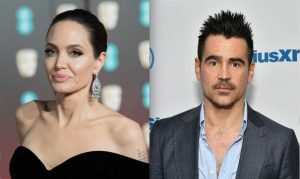 Some claim that the real reason Angelina and her kids show up to the Dumbo premiere was to lend support to the star Colin Farrell. In 2004, the A-listers claim to have had a throwback when they both starred in Alexander. And now there are claims that their romance has been restarted. Still, this not confirms by them or either party. Is Angelina Jolie still in touch with Brad Pitt? The former couple is still in touch as they weave their way through raising their six children. As they were known as ‘Brangelina’ but had a well-document nasty divorce. Angelina asked a divorce judge to end her marriage with Brad Pitt in August 2018. The actor was failing to pay her “meaningful child support” reports claiming. The Maleficent star, 43, filed legal documents in her nasty split with the Benjamin Button actor, 54, whom she separated from back in 2016. Though it is thought that the couple maintains a civil relationship as they try to handle joint custody of their brood. Why did Angelina Jolie and Brad Pitt Breakup? In September 2016, the couple filed for divorce following an incident. On a plane when Brad pitt allegedly lost control of himself and disagreement with son Maddox, 16. The Hollywood couple then releases a joint statement publicly where they stated they’d agreed to settle their divorce in private. Angelina spoke out about the divorce for the first time in February 2017. Saying that “we will get through this time and hopefully be a stronger family for it”. In August 2017, Reports say that divorce had been “put on hold”. And they were even thinking about getting back together after “spiritual counselling”. However, this February they receive court approval to continue negotiating the terms or condition of the divorce.